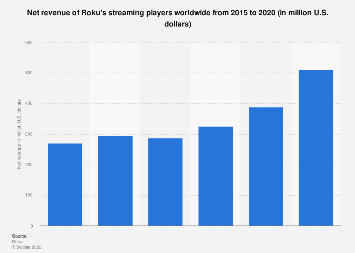 Just weeks after its successful IPO on September 28, Roku, maker of the namesake TV streaming devices, nailed its first earnings report as a public company on Wednesday. 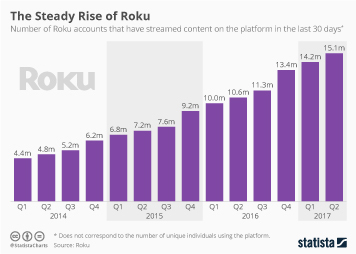 Having beaten Wall Street estimates on revenue growth and provided a positive outlook for the fourth quarter, Roku’s shares were up by as much as 44 percent in early trading the morning after. At more than $27 a share, Roku is now valued nearly twice as high as it was in its IPO six weeks ago. The company’s streaming devices have been used to stream a whopping 3.8 billion hours of music and video content in the third quarter of 2017, equating to nearly 2.5 hours of daily streaming per user. 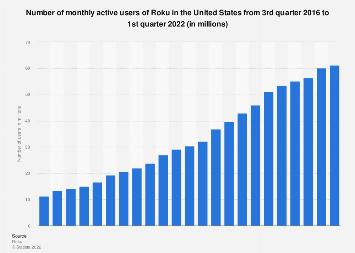 The amount of time people spend actually using Roku’s devices is immensely important, because the company generates nearly half of its revenue with its quickly growing platform business, which consists of advertising, subscription commissions and licensing deals. 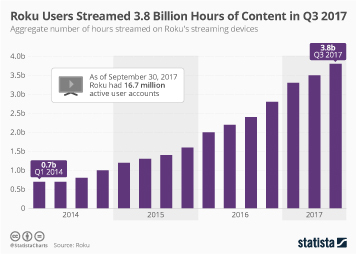 This chart shows the aggregate number of hours streamed on Roku's streaming devices.